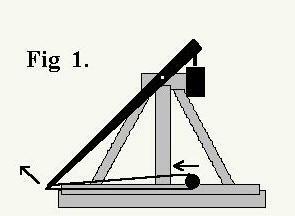 Some very simple counter-weight trebuchet theory. This is definitely not intended to be an in-depth study of the counter-weight trebuchet (you can find people on the web who can give you the heavy-duty mathematics.. see the Virtual Hurling page for some links).  Instead, it is a simple look at a few points that would-be trebuchet builders are likely to encounter first. Much of this info is derived from models. Many people will tell you that trebuchets don't scale up from models very well. This is certainly true about some proportions (like the size of the weight bucket), the material strengths and the ranges you can expect to achieve - but the basic mechanics remain the same. 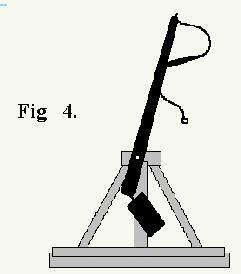 This diagram shows a trebuchet shortly after the trigger has been released. The shot is in the sling and is beginning to slide backwards along a launch trough. The trough is put there to guide the sling and prevent it from getting caught up in the trebuchet's framework. In the early part of the launch all the shot's motion is horizontal and this speed will contribute to the rate at which the sling is going to be whipped around the end of the treb's beam later. The trebuchet is designed so that the beam is pulled down as nearly vertical as is practical. This gives two benefits: 1. the weight has the longest distance to fall this way and 2. the first movement of the beam gives the most horizontal pull to the sling. The sling has to be picked up by the beam, so it can't be too long. (You wouldn't want the treb to be standing with its beam in the air and the shot still in the trough) Generally, this means a sling length something less than the beam's throwing arm length, although some medieval illustrations show longer slings. Here the trebuchet beam has rotated and of course the end holding the sling has risen. The shot has been pulled down the trough and is now speeding backwards, but it has also been lifted up and clear. Now, any weight which is tied by a length of rope to the end of a rotating beam is going to swing out - the so-called centrifugal force (okay, it's actually just inertia in action, but you get the picture). Our shot's motion has this effect plus the speed it has already acquired. The result is that the sling will rotate around the end of the beam. If your trebuchet's release mechanism is the usual ring over a prong or hook, it is going to release the sling as soon as the angle between the sling ropes and the arm is straight enough for the ring to slip off the prong. By setting the angle of the prong - a more hooked prong will hold the sling loop longer than a straighter one. By changing the length of the cords that hold the sling pouch.. If the sling is rotating around the end of the beam slowly, the beam will have time to swing through a bigger arc before the sling catches up to it. If the sling is rotating quickly, the release angle will happen earlier. A shorter sling will rotate faster than a long sling. By choosing the size of your shot..
Another thing that influences when a sling releases is the force on it - a heavier projectile tends to pull the loop off the prong earlier than a lighter projectile does. Finally, the follow-through ... A bit disappointing, really. It's not as much as you might imagine. If you had the weight fixed rigidly to the end of your treb's beam (like Huw Kennedy's huge piano and car throwing beast in Britain) you would have a simple pendulum and it might well oscillate majestically until it eventually came to a stop. The design shown in figures 1 to 4 uses a free-swinging weight and the interfering motions pull up the beam in a series of jerks and starts. 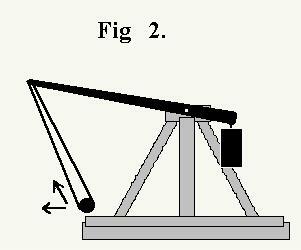 Why doesn't making a trebuchet half as big make it half as heavy and powerful? 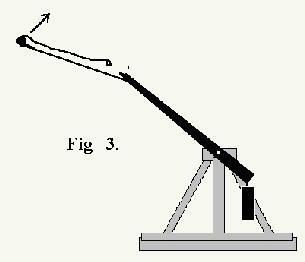 Why can't a toy-sized trebuchet have a weight bucket in the same proportion to the machine as a big one? It's simply mathematics... if you make a box twice as big in size - twice as long, twice as wide and twice as deep - you actually make its volume eight times larger. (volume = length x breadth x depth for a box with right-angled corners). Going in the opposite direction, if you make a model trebuchet half the size, then its box will only hold 1/8th the weight unless you either make it much bigger than it looked on the large machine or fill it with something heavier than soil and rock. This is why model trebuchets often have over-sized buckets or are filled with lead (or both).